We left home at 7 this morning. Joe joined us on our ride today. He was heading for Grand Beach. We stopped in Upsula for gas and who should come along – Jason and Linda Robertson and boys. We chatted for a bit and continued our journey. About 20 km from Dryden Joe coasted to the side of the road – he was out of gas!! 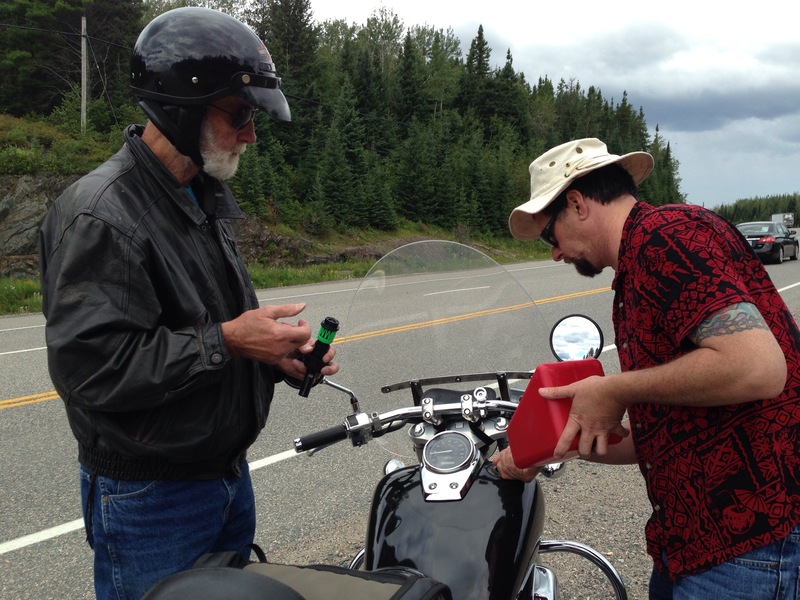 Now if you read my last post you will remember we ran out of gas coming back from Grand Marais and Joe went to get gas for us. So it was now Mac’s turn to return the favour. Mac returned awhile later with 2 cans of gas. He decided better have I filled at all times!! Was a very long day! Was extremely windy. Ran into a few areas of rain! We finally arrived in Winnipeg and are staying with my cousin Karen and her husband Gerry. Thank you for your hospitality! Great dinner! Great conversation!! We want to keep track of the wildlife we see. The only thing we saw today was 1deer and that was on Balmoral St just north of the police station on our way to meet Joe!!! Too funny!!! Thought we better take a ride somewhere so Grand Marais was a good choice. Joe and Jan joined us. 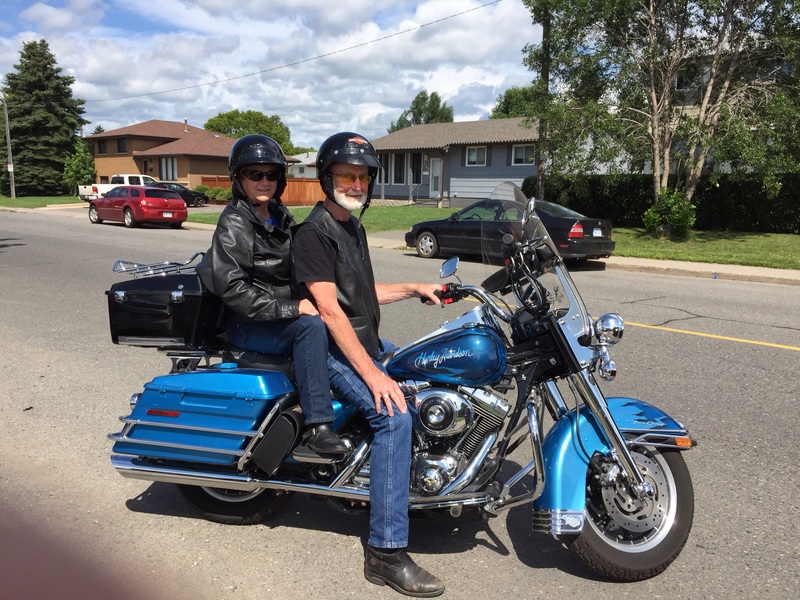 Had a great ride down – had a nice lunch and headed back. Before we left Grand Marais Mac and Joe talked about fueling up and decided on Ryden’s. Half way back to the border I can see Mac looking at something – he leaned back and said I have no gas!! He pulled over and Joe followed us. He decided to see how far he could go – well that wasn’t very far – we coasted nicely to the side of the road. Good thing a gas can came with the bike! Mac handed Joe the can and off the y road on their reserve (Joe didn’t check his gauge very well either!!) to get us gas. We had our other bike for 25 years and not once did Mac run out of gas – I don’t think this will ever happen again!! Of course we weren’t even stopped by the lake – just a long stretch of nothing on the highway. 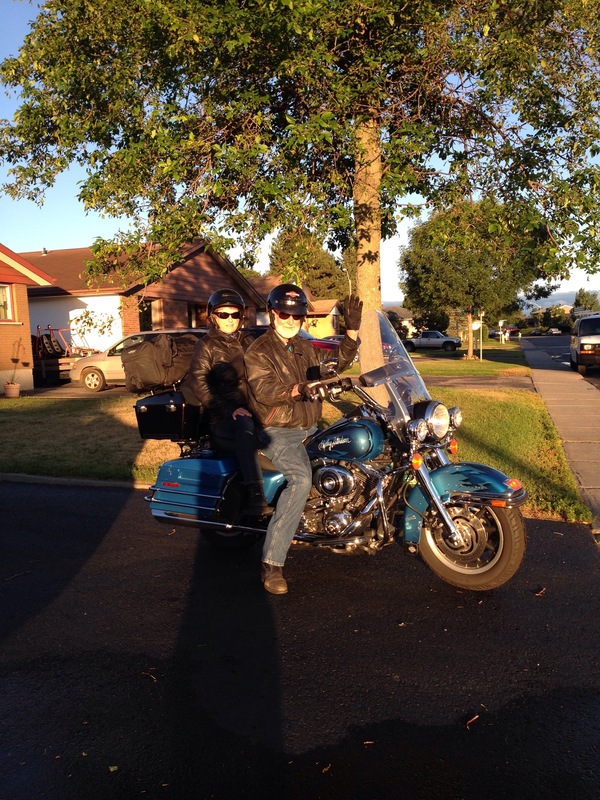 A couple on a Harley stopped to see if we were ok and I was so pleased to tell them we ran out of gas – lol!!! Mac waved on the others that were going to stop – you have to love bikers!! Joe and Jan came back and onwards we went!!! Mac decided 2 weeks before we leave for Alaska that we needed a new bike. He fell in love with the throaty rumble of this bike and had to have it! !